Information about the location. 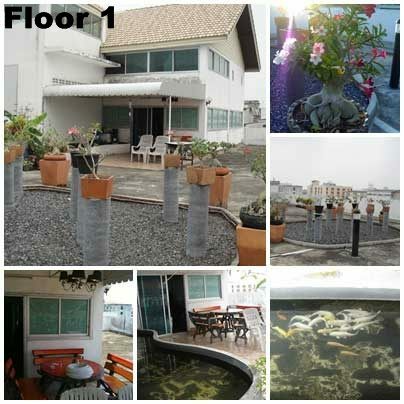 Commercial Building 5 floor (top floor) that is located on Ramkhamhaeng Road, Soi 24 pages Pooonrnepoitsin (split 12) opposite the back door of Ram. Area of 100 square meters (400 square meters). Furnished. A fully furnished two storey two bedroom, one bathroom + bath room, view, display cabinets place of + a TV stand * 2, vanity * 2, closet * 2, double bed, 5 '* 2, desk + drawer , Tables, chairs meetings, sofa, 3 sets + Coffee table, lamp, aquarium furniture 60 inches, a fish pond with garden planting trees on the roof, shelf, King, Kitchen Built-in + closet + a dishwasher, dining table 6. seat, direct-dial phone + number (for services to Hi-speed Internet True). In-room amenities such as refrigerator, microwave, rice cooker, electric oven grill, water heater , Stereo radio, TV 3 (Lcd * 2), 3-Air, ps2 + 50 games discs, DVD + Speakers + Mic * 2, Cable 2 red spot plates 100 channels No monthly DTV * 2. Everything is ready to use. Facilities within the condominium units. 24-hour security, key card, and a CCD camera + A 24 guard, parking, cash-flush, washing machine, shop, mini mart, restaurant, beauty salon, Cabinet bank ATM 7. Cabinet bottom of the building, Watson, Lift, Restaurant Internet Cafe '. Convenient Store near Abac M. M. Ram Ram bigC themall route to New Rama 9 - Development. - Rent 15,000 baht / month - 2 months deposit rooms - 1 month deposit. Total = 45,000 to address immediate water 18 baht per unit of electricity 8 baht per unit.